Sometime in late August, this blog hit 200,000 page views. When I first posted back in late November of 2011, I had no idea how any of this would evolve or whether anyone would be interested in reading about some fictitious creation that I had developed. My hope was that, through the blog, I could offer some inspiration as repayment for all of the inspiration I've received over the years from the work of so many others. Looking back over the last five years, I'm somewhat surprised in the amount of interest in the blog. But it has been fun and a great way to share some of the things I've learned in the hobby. I've had more fun and accomplished more in the past five years than in the prior twenty years in the hobby combined. And that's been primarily due to the great friendships that have developed over that period of time. I really never understood how neat it could be to share my passion for the hobby and railroads with others who felt the same. So to all of you who have either put up with my antics or enjoyed the postings on this blog, or both, I say thanks. It's been a great five years and I hope the next five are just as memorable. I'll close with a shot of the Elkwater Branch Roustabout heading back to North Pierce. Well, the Labor Day weekend has arrived and with it the unofficial end of Summer. My wife and I spent most of the past three months in Michigan, and as a result, not much got accomplished on the railroad. However, there were a number of projects in the works that got finished up before we left. Here's an update on some of them. The new signal at the west end of Nelsonville Yard is now in place and operational. In a previous post, I commented on the need to move this signal from it's original location. Here's a ink to that post: http://cwerailroad.blogspot.com/2016/01/well-that-wont-work.html. 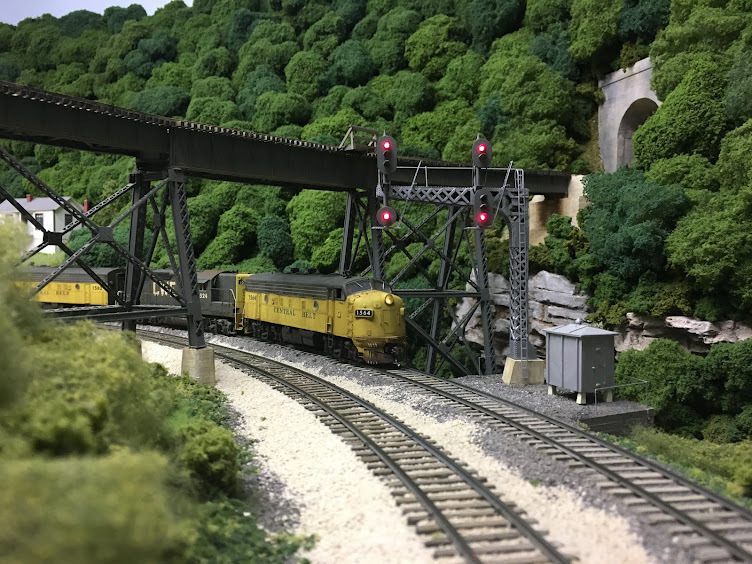 The picture below shows the finished signal bridge. The deck girder bridges across Clear Creek next to the engine terminal at Nelsonville have been completed. The scenery on either side of the bridges still needs to be finished, but the hard part is finished. The stream was poured using EnviroTex Lite pour-on High Gloss Finish. The scenery around the station at Nelsonville has also been finished for the most part. Additional details need to be added such as switch machines, steps to the platform, grade crossing signals, etc. And lastly, the two N&W SD35 that were last seen on the workbench in December have been reassembled and weathered. Both units received Tsunami sound decoders. I used artist's oils for the majority of the weathering. I wasn't please with how the weathering initially turned out on the roofs, so I went back and applied Pan Pastels with a deerfoot brush. I picked up this technique from Mike Confalone in his Weathering Like a Pro video series. If you haven't seen any of these and your interested in weathering, you really need to check these out. They are available from the Model Railroad Hobbyist and here's a link: http://store.mrhmag.com/store/c1/Featured_Products.html. I have used Pan Pastels in the past and have never been overly impressed with them. However, Mike's videos show some unique and different ways to use them that produce some really great results. Here's how the roofs turned out. I did manage to get six of the new Bowser woodchip hopper cars built over the summer and they are now in the paint shop. Several other cars were painted and lettered and are now ready for weathering. A number of other new projects are in the works. While the summer was a blast, it's great to back workin' on the railroad!